Over my years in my practice, I have been fortunate enough to witness the most dramatic transformations in health. Whether it is helping people lose weight and boost their metabolism, or improving mood, energy and sense of well being with food – I know for sure that diet is one of the main keys to being your best self. Before approaching the holiday season, I encourage you to commit to one little baby step when it comes to your health. It can be drinking more water, waking up 10 minutes early to stretch or even going for a manicure once per week. We only come around this way once, and it is so important to take care of you. Along with announcing my new book, which will appear in, stores Jan (very exciting! ), this Dr. Joey newsletter is filled with tasty new products (my new favorite goat’s cheese), weight loss promotions, delicious and filling low calorie recipes and information on how to create the perfect grocery shop. Tune in on October 20th to see Dr. Joey on Cityline! Finally, after being in the weight loss world for over a decade and helping thousands lose the weight and live their lives to the fullest – Dr. Joey is ready to share her secrets with every person wanting to lose their weight for good. In The Metabolism Boosing Diet (Harper Collins, 2012)– readers will discover how to lose weight, balance hormones, burn fat and feel their best at any age and any stage. Whether you have 5 or 50 pounds to lose – Dr. Joey’s unique approach to personalizing your weight loss journey offers fast and effective results. If you want to lose weight, you must do it with Dr. Joey. She is magic! Did you miss Dr. Joey on Cityline? Click here to watch her talk about the perfect grocery shop! Check out Dr. Joey’s article on health skin in ELLE magazine. Click here to view. This is my new favorite goat’s cheese (I have it daily in my egg whites or on top of vegetables or salad). Woolwich Dairy makes a variety of firm and soft goat's milk cheese topped with delicious combinations like fine herb or cranberry cinnamon that are great for entertaining. Nutritionally, goat cheese contains less lactose than cow's milk cheese and has smaller fat globules, making it easier to digest. Steaming is the best way to preserve nutrients in your veggies. This silicone steamer by Trudeau lets you steam and remove your veggies from any pot in one fell swoop. Bring your cup of ohm with you wherever you go! We love the Timolino because it's slim and stylish while keeping it practical with a hidden compartment to store loose tea under the lid. Ginger is great for soothing sore throats and tummies as well as easing nausea, cold and flu symptoms. Sweetened with honey, this all-natural drink is a best served warm as a morning wake-up or as a healthy pick-me-up later in the day. Each 12-ounce bottle has the equivalent of 19 grams of ginger for only 80 calories. Available at most health food stores. Not baked, not fried, but freeze dried! This tasty snack is made by placing frozen vegetables in a refrigerated vacuum chamber which removes up to 97% of the moisture. The result is intensified veggie flavor and near 100% nutrient and enzyme retention.A great alternative to chips or popcorn, Veggie Crunchies count towards your 7 to 10 servings of fruits and vegetables per day. My favorite – the brown rice and edamame! Also known as broccoli rabe, rapini is loaded with immune-boosting vitamin C that we all need more of this time of year. It's also a great source of beta-carotene and lutein, two nutrients known to keep our eyes bright and healthy. 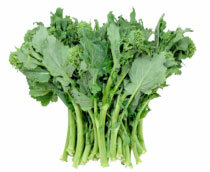 Did you know that all parts of rapini are edible, including the buds and the flowers? Rapini's mildly bitter taste (a testament to all the phytonutrients it contains) pairs well with garlic and hot chili flakes. It can be added to almost any dish (like the chili recipe below), or as a stand-alone side to fish, beef or chicken. Simply, rinse then trim a quarter of an inch from the bottom before chopping into bite-sized pieces. Like most other robust leafy greens, rapini can be blanched, braised, sautéed or steamed. Cut chiles in half; discard seeds and membranes. Place halves, skin sides up, on a foil-lined baking sheet; flatten with hand. Broil 5 minutes or until blackened. Place in a heavy-duty zip-top plastic bag; seal. Let stand 15 minutes. Peel chiles; discard skins. Chop chiles. Heat oil in a large Dutch oven over medium-high heat. Add onion and garlic, and sauté until softened, stirring frequently. Add rapini and continue to sauté until wilted. Add cooked, chopped chicken to pan. Add broth, 1 1/2 cups water, and cumin; bring to a simmer. Stir in chopped chiles and beans. Combine 1/2 cup water and flour, stirring with a whisk. Stir into chicken mixture. Bring to a simmer; cook 15 minutes. Spoon about 1 1/2 cups soup into each of 6 bowls; top each serving with 1 1/2 teaspoons sour cream or yogurt. Serve with lime slices as garnish. Heat fat free cooking spray in skillet. Add spinach and salmon. Cook until spinach is shiny and wilted, but still a little firm. Add dill. While spinach is cooking, beat egg and cheese together until fluffy. Pour egg mixture over spinach and salmon. Stir frequently. Cook until eggs are desired firmness. Serve with a tablespoon of sour cream or Greek yogurt. Cut squash in half lengthwise; discard seeds and membrane. Place squash halves, cut sides down, on a baking sheet; bake at 375° for 45 minutes or until tender. Cool. Peel squash. Mash pulp. Set aside 2 cups pulp, reserving remaining pulp for another use. Combine 2 cups squash pulp, milk, and next 4 ingredients (milk through egg white) in a food processor; process until smooth. Pour into a 1-quart soufflé dish coated with cooking spray. Place soufflé dish in a 9-inch square baking pan; add hot water to pan to a depth of 1 inch. Bake at 375° for 40 minutes or until puffy and set. While squash is baking, bring water and 1/2 teaspoon salt to a boil in an 8-quart stockpot or Dutch oven. Add greens; cover and cook 8 minutes. Drain well; toss with butter. Serve immediately. In university, my “go to” appetizer was a big plate of nachos! Unfortunately, most nacho platters are filled with saturated fats, calories and carbohydrates. So... in order to enjoy my favorite appetizer, I have come up with a low carb nacho salad that truly delivers the same taste. On a baking pan lined with tin foil, spread a fresh bed of shredded lettuce. Distribute meat, olives, chopped tomatoes, green onion and any additional toppings. Sprinkle with cheese. Heat oven to 350 and broil for 3 minutes or until cheese is bubbling. Remove immediately and serve. Serve with guacamole or low fat cottage cheese if desired. Cover each half of the squash with the softened butter and top with an even sprinkling of the lemon pepper seasoning. Bake for about 50 minutes until squash is a deep golden color. After removing squash from the oven, scrape out the inside with a for until the flesh resembles spaghetti pasta. Place the squash in a bowl and toss with the goat cheese and fresh herbs while still warm. Divide the servings and serve immediately. Makes a great alternative pasta. Yield: 2 servings as a main course, or 4 as a side dish. Check out the CityLIne winners who lost weight with Dr. Joey! Congratulations to Tracy and Valerie – you both look amazing! Don’t let the holidays get in the way of losing the weight and getting healthy. Come in and book your free weight loss assessment today! 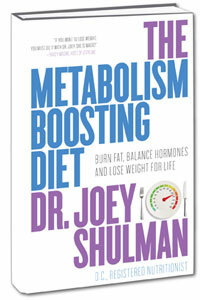 If you book prior to Dec. 31st- you will receive 10% off any Shulman Weight Loss program by mentioning this newsletter. Offer expires Dec. 31st, 2011.